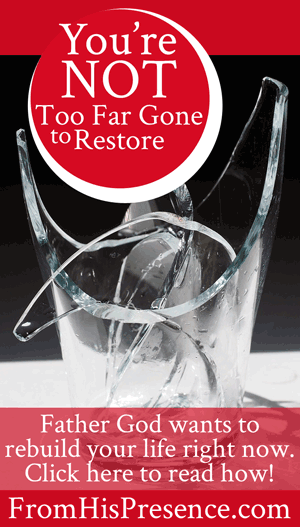 You're Not Too Far Gone to Restore! 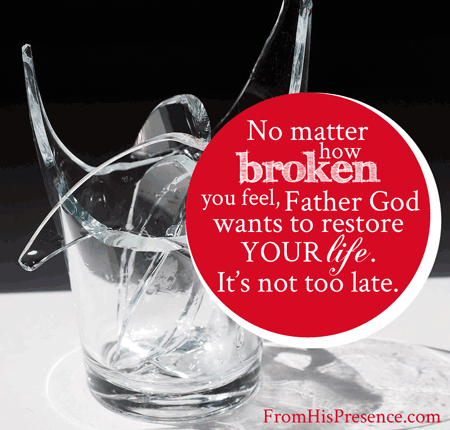 You’re Not Too Far Gone to Restore! The Lord told me today that some of you are afraid that you’re too far gone to restore. You think you’ve crossed the line; been abandoned by God; done too much that’s wrong, or wandered too far away. And He told me to tell you that, beloved son, beloved daughter: It is not too late for you. It’s always Father’s will to heal you. It’s always Father’s will to restore you. For your hands are defiled with blood, and your fingers with iniquity; your lips have spoken lies, your tongue has muttered perversity” (Isaiah 59:1-3). God is ready and eager to help you and restore you FULLY, no matter what your circumstance is. If you’re sitting in jail while you’re reading this, He wants to restore you. If you’re sitting in divorce court, He wants to restore you. If you cried yourself to sleep last night for any reason at all, He wants to restore you. Anytime we sin, it causes problems. Sin breaks things and hurts people, including you. That’s just fact. But no matter what you’ve done, you can be forgiven and restored–right now, today! Beloved, you can be restored. Your life can be fully healed and rebuilt, better than it ever was before. If you’ve gotten into sin, restoration is going to take some changing on your part. It’s going to take some choosing. You’ll have to choose to abandon your sin and seek Him instead. But you don’t have to go it alone; He knows you’re weak on your own, so He’ll be right there with you all the way. Click on the image to share this post and meme on Facebook! Your weakness is okay with God. It makes you dependent on Him, and He WANTS you to depend on Him. And AS SOON as you turn your face to seek Him, you will find that He’s been right there waiting on you, all along. Beloved, you are not too far gone to restore. And nothing you care about is too far gone to restore either. Not too late for you to rebuild your life after incarceration, addiction, homelessness, or abuse. The enemy has been trying to tell you it’s too late, but hear the word of the Lord today: It’s not too late. It’s not too late. It’s not too late. God can and will restore you if you will seek Him. Will you seek Him today, and allow Him to restore you as you focus on Him? Rebuke those lying, condemning thoughts, because they’re not from God! God never condemns, no matter what you’ve done. He’s always looking to restore, and is just waiting for you to realize that and turn to him, even in your weakness. 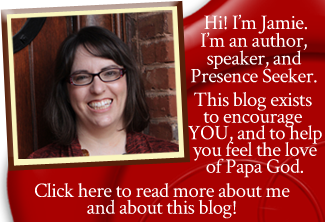 You are worth Jesus’ sacrifice…He says so! Thanks Nettie, very much appreciated. I agree but we do have to make changes, Jesus continues to love, and the devil will constantly accuse. Choose to listen to love but go and sin no more because grace is a gift not to be taken lightly. I have been here…not believing that I could be restored. God showed me differently and I am restored today, as a result of God not giving up on me. Don’t ever give up and don’t be discouraged. I have seen God work in my own life. Just a few years ago I was a skid row alcoholic. After seeking God’s healing and forgiveness, I haven’t had a drink in 3 years. I have seen God restore others as well. I have learned God is love and does love His children. Praying for you over here. Totally BLEW IT last week (embarrassing!) Working on getting thing back where they need to be. In prophetic ministry training and ended up in a church that I’ m not sure about. Keep me in prayer. I feel like I wasted 4 years, not sure I’m accurate on that but it’s a tough issue pray please.